BLOG 20 – AHHHHHhhhhh ! Sometimes you can lose your dignity when everything is stripped away. But sometimes it brings things to life! That’s how the bus felt once we’d made it naked. We stripped everything out the back. Everything. Apart from the headliner – which needs a headlining expert to fit. The stripping away revealed a raw beauty to behold. You could conjure up images of the bus on the production line, all shiny and spanking new, before the fittings were welded and screwed and bolted on. You could dream up the life of adventure ahead of it and of all the things it would see and do over the next 40 years. Happy thoughts. On the other hand, you could stand there, stare at it and say “ahh feck !!”. The belly of the bus is ribbed. The floor bit between the seats at the front and the engine at the back – it’s ribbed. Like corrugated iron. The ribbedness gives it strength, dimension and sole. I like it. We used this stripping out time to give the innards a real good scrub. Behind the panels we found a bus map of Sydney and some coins including a New Zealand 10 cents coin. I’m going to keep them as a kind a historical memento. 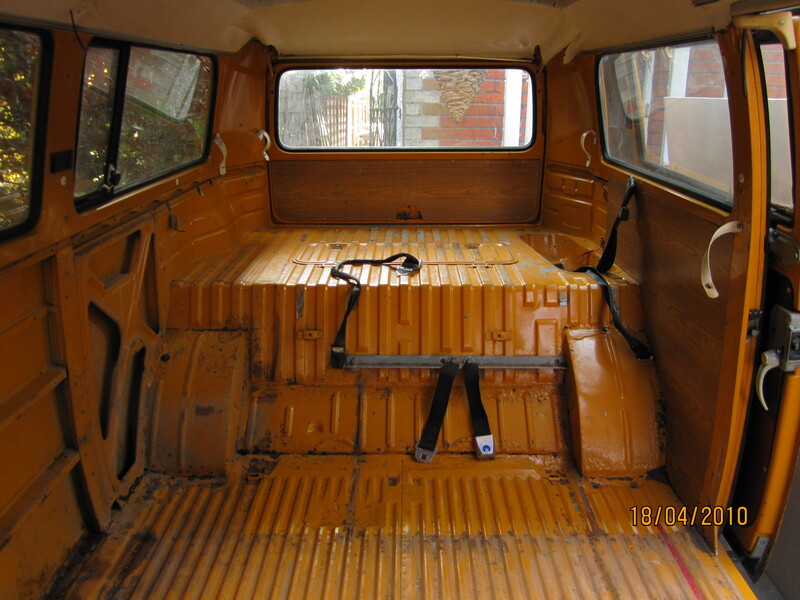 The ribbed bus floor was going to be covered with a new flat floor – never to be seen again. So I gave the ribs a good lick of Hammerite paint to protect them forever and ever and then laid beneath the new floor some speaker wires and two other 5amp power cables that could be used at some point later thus save me loads of hassle in trying to hide cabling in the future. Forward thinking eh! Now the bus was clean naked it was time to think about the yet to be built internal layout. You ready for this John? Ahh John – so called because of John’s tendency to put the word, or sound ‘ahhhh’ at the front of every other sentence. And I swear this is the complete truth. Ahh John also types in the word ‘ahh’ in his text messages. I promise I did not make that bit up. Ahhh. John – if you ever read this please understand the degree of embellishment needed for the story to fit the fantasy world in my head. Ahhh. Corrugated Iron – is a commonly used phrase to describe corrugated metal things that are commonly not actually made of iron. We haven’t made things out of real iron since the Iron Age. Including actual irons, which were probably never made out of iron. Ever. And the reason they stopped making things out of iron is because iron is not that strong for a metal. For example, an iron beam becomes wobbly and bends too easily, unlike, say a steel beam which isn’t so wobbly. Another example is Jim Beam. This is pretty strong stuff, but weirdly, it can make those who come into touch with it a bit wobbly. One way to strengthen iron without making it thicker, and therefore heavier, is to make it inflexible. And you do this by making it corrugated. Working on the theory that iron is rubbish, why do they call ‘Iron Marathons’ Iron Marathons? The Corrugated Iron Marathon is just too much of a mouthful I guess. Here he comes the new Super Hero, Corrugated Iron Man – doesn’t quite have the same ring to it does it? Talking of Super Heroes, did I ever introduce Power Tool and Dremmel Boy to this blog? One day, I am sure you will meet Power Tool and his trusty side kick Dremmel Boy. THWACK ! SLAM ! BISH BASH BOSCH! Do you know how they say the word ‘coin’ in New Zealand? Like this. ‘kine’. It’s a tough accent to get right. Keep practicing, it’s well worth it.